Water skiing is a fun and rewarding surface water sport that requires a combination of upper body strength, lower body strength, flexibility, balance, and muscle endurance. Experienced water skiers gracefully glide over the water’s surface while performing various tricks, leading many people to believe the sport is easy. Upon gearing up in a pair of skis and holding the rope for the first time, however, you’ll quickly realize it’s anything but easy. Standing up is often viewed as one of the most difficult steps in water skiing, but if you can’t step up, you won’t be able to participate in the sport. If you’re struggling to gain your footing, we have some advice that will help. 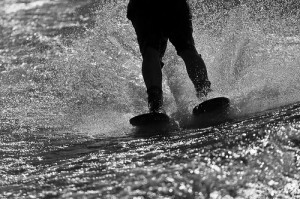 There are two different ways to stand up when water skiing: a shallow water start, or a deep water start. A shallow water start is characterized by the skier standing in shallow water (hence the name), whereas a deep water start is characterized by the skier floating on his or her back in deep water. Since shallow water allows you to maintain the correct posture before the boat begins pulling, it’s the recommended starting method for beginners. When you’re ready to be pulled, give the boat driver a thumbs up while quickly moving your signaling hand back to the rope. The first tug throws many people off balance, so maintaining your posture during this stage is crucial to your success. During the initial tug, bend your knees so they are pressed against your chest and lean your body back. As the boat gains speed, there will be less and less slack in the rope. Maintain this position and try to keep your knees fixated at a 70-degree angle. From the moment you are about to stand up (or if you’re already standing up using the shallow water method), your skis should be roughly shoulder-width apart and almost completely parallel to one another. Another good rule of thumb to follow is to keep at least 6-12 inches of skis above water. Avoid looking down or off to the sides. Your eyes, and head, should be focused on the boat as it pulls you. Use hand signals to let the boat driver know if you want to go faster or slower (thumbs up and thumbs down works well). Push your feet forward when the boat is gaining speed. If, or should I say when, you fall, let go of the rope. Always wear a personal flotation device when water skiing. Keep your arms extended straight out with a slight bend in the elbows.